Lesley Pymm reports: A bit misleading this! I think they called it 6 miles when it first started and before everyone was running round with GPS gadgets. I make it about 5.25 miles – but it certainly feels like 6! Shobdon Woods are not flat by any means. As the man said in the briefing, ‘the race has to be predominantly downhill as you have all climbed so far to the start’. It was true that the start was a long climb from the car parking area – I used it as a warm up and jogged it, many others were walking it and a few actually ran it! Soon we were off and we were continuing uphill on forestry paths. Then we turned off and went onto woodland narrow paths – still uphill. I was trying to run but it was difficult as there was a queue of people walking in front of me. Then I realised that there was a gap in front of the woman about 5 ahead of me so I managed to get around this little group and catch up with the next lot of walkers. By then I was nearly at the top and then turned right and downhill, again on forestry tracks. We ran past supporters who had taken the short cut to this point and continued on down. The problem with downhills on this sort of event is that you know there will be an equivalent uphill! The downhill then went off the track onto a muddy narrow path. I passed a runner who had gone over his ankle and was being helped by a marshal. I was overtaking people who were not wearing shoes with enough grip. A number had trail shoes on, but that was not enough on some of the muddy bits. At the bottom we turned again and were back onto the wider stoney tracks – and climbing. I passed a couple of marshals who I knew as they were the wife and daughter of one of the Croft Ambrey Runners I have got to know at the Shropshire Fell Runs (see Laura’s report) and I met his daughter, Alison, at Ludlow parkrun the previous day. This was fairly long uphill, but I knew it was not the worst climb. After a bit more downhill we were again climbing and I knew this was the one that everyone remembered! It is not too steep but just goes on and on. Eventually towards the false summit, I cold see runners going off right and knew that was where we did a mini loop and then continued up on a muddier path. I was overtaking a few people on this bit and then we turned and were going down on a wide track. I knew that it would be difficult to get past anyone when we turned off the track, so did my best. Then we were into the highlight of the event – the bluebells. It is a fantastic downhill section through amazing bluebells. You do have to take care as there are tree roots in the woods but it was brilliant. I was running behind a young woman who did keep moving over the let me pass when it widened slightly, but I as was only going a bit faster than her I was not able to pass. Then we got to a muddy bit on the bend and she knew she would have problems on this so she stood aside so that I could pass her. That was it, she wasn’t going to pass me now. I charged through the rest of the woods and turned onto the final run in, still charging. It is such a great finish! I was shouted in by, amongst others, the RD from the parkrun the previous day. A walk down to the HQ area where there was tea/coffee and big bags of posh crisps and jam doughnuts. All very healthy!! We had already collected our event T-shirts with our numbers. The car was blocked in so I couldn’t get away if I wanted to. I didn’t as I like to stay for the presentations when I can. Good friendly run, good value at £8. 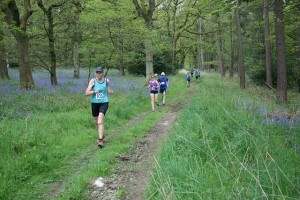 This entry was posted in Fell, Multi-terrain, Race Reports by Race Reports. Bookmark the permalink.